Kept myself quite busy during the last day of 2010 with reading for my class that starts on the 4th. Yes, I’m one of those people who starts reading the textbook before the class even starts. Though when the class is only 4 weeks long it’s sort of a necessity. I did take a nice long break about half way through the chapter on “Foreign Currency Transactions and Hedging” to finish off a pair of earrings for a custom order. Unfortunately I forgot to take pictures before getting them all packaged up though. Also got started on writing up those split ring bracelets for the Shuttlebirds workshop. Hope to have a working version done by next week so I can ask some other tatters to proof them. Spent more time than I should have flipping through the Priscilla tatting pattern books. Very excited to start working my way through some of the patterns in them. Not today though. Plans for the rest of 2010 involve more reading about foreign currency transactions and then heading out to the critical mass bike ride at Balboa Park with my brother. I’ve mana ged to get talked into teach 5 classes at the Shuttlebirds tatting workshop in Spokane in April. I’m very excited about it, but a bit worried about getting everything ready for all five of them in time since right now the classes still seem a little vague in my mind. So I’m getting started now and worked up a couple samples for the most well-defined of the classes, a split ring bracelet with beads. 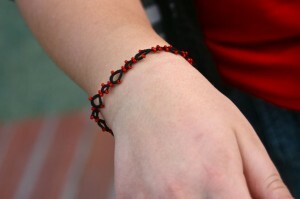 Here they are, modeled on my lovely second-cousin’s wrists. The next step is to actually write up the patterns and test it out. That’s going to be one of next week’s projects.